Financial independence is a prerequisite for impartial news coverage. That is why Free Press Unlimited continued to broaden its financial basis in 2016. After having already hired a second fundraising specialist who focuses on international private funds and major donors in October 2015, in March 2016, we added a fundraiser for private donors (our Friends). Although in the beginning, building a relationship with new funds and donors requires sizeable investments, we can already report a number of positive results. Our success rate among international private funds has proven relatively high for a first year of fundraising: 26 percent of the 23 proposals submitted to these parties were approved for funding. These new funds mainly supported our programmes in Sudan and the whistle-blower platform Publeaks, although we also received a number of un-earmarked funds. The latter category remains very important for Free Press Unlimited, since we are unable to predict the course of some of our activities. Around one-third of our programmes and projects over the next five years are possible thanks to the support of the Dutch Ministry of Foreign Affairs, within our Strategic Partnership ‘No News is Bad News’. In November, the Swedish organisation Sida decided to provide our programme in Syria with funding support for a term of five years. And in 2016, another highly valued donor, the Dutch Postcode Lottery, once again pledged its support to our work for another five years, increasing their structural contribution. We are delighted with this kind of long-term funding: it is of vital importance for the success of Free Press Unlimited’s mission. After all, it takes more than a few years to set up a durable independent information service and build public trust in the local media. Particularly in conflict area, this can easily take as much as a generation. We often try to ‘make ends meet’ by linking the different funding streams – individual project budgets – together to cover a long-term investment. However, in many cases, this process is quite difficult, and it furthermore takes a lot of time and energy. This is another reason why the confidence that these major donors have shown in us and our partners is of such tremendous value. We are fortunate to have 2770 Friends of Free Press Unlimited, who help make our work possible. They are dedicated and critical individuals, and are not afraid to share their thoughts and occasionally help us hold a mirror to ourselves. 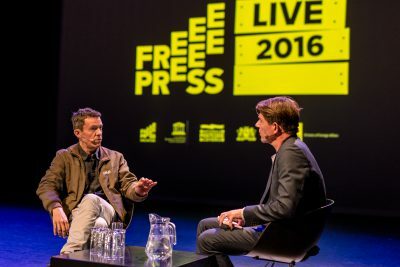 In 2016, we organised the first edition of the Friends Live event, which was filled to capacity. During this event, we invited our Friends ‘in our home’: offering them a guided tour of our offices, with a number of ‘pit stops’ during which we talked about our projects. One of the staff members of the new Russian-Language News Exchange offered a glimpse of the state of the media in today’s Russia. Why is Putin actually so popular in his own country? The editors of Radio Dabanga explained how they succeed in broadcasting independent news reports in Darfur. And the party was rounded off with a meal cooked up by The Syrian Chef. Our Friends’ responses were heart-warming and a welcome boost for Free Press Unlimited’s – occasionally too modest – staff members. We can be proud of our work, and of our loyal Friends. We look forward to welcoming them again next year, during Friends Live 2017. Countless other Dutch citizens also find our work deserving of their support. In 2016, we received a total of 54,000 in donations from private citizens – a 8,000 euros less than in 2015. This can be explained by the fact that in 2015, after the Charlie Hebdo attack, we received a number of extra donations. . We are very grateful for their involvement with and financial support for our projects. In 2016, after a very favourable evaluation of our work, the Dutch Postcode Lottery once again decided to team up with Free Press Unlimited for another five-year term. We are grateful to the 2.7 million people who take part in the Dutch Postcode Lottery. Through their participation, they help give people in countries like Bangladesh and Sudan access to reliable, unbiased information. In addition, the Dutch Postcode Lottyer organisation awarded Free Press Unlimited an un-earmarked contribution of € 900,000 in 2016. In a nutshell, this is why the Dutch Postcode Lottery and major donors like the private fund Humanity United (part of the Omidyar Group) support our work. Their willingness to support our activities with funding, think along and collaborate with us is of vital importance for journalists and media organisations in fragile states. Since 2009, the Dutch Postcode Lottery Fund has been enabling Dutch journalists to make unique international reportages. These reports consistently focus on important issues like the environment, human rights or people’s daily lives abroad. The Netherlands’ media organisations have less and less budget for foreign reports, most of the reports are made based on desk research. Thanks to the Dutch Postcode Lottery Fund, journalists can travel abroad and inform the Dutch public via the radio, television, the internet and print publications. The ongoing need for this funding is once again illustrated by the increased number of applications in the year under review: from 57 in 2015 to 72 in 2016. We awarded funding to a total of 27 trips, which yielded 25 publications in 2016 alone. In 2016, the Dutch Nationale Postcode Lottery decided to continue supporting this important programme for another two years and increased the annual contribution to € 250,000 per year. It approved our request to expand the Dutch Postcode Lottery Fund’s scope to include investigative journalism productions. Starting in the second half of 2016, the fund will offer additional funding opportunities for in-depth, critical investigative reportages that include attention to women’s rights. The fund has already approved the first application in this field, and the two female journalists are currently on location. The results of their work will be published in the course of 2017. However, it did become clear from the details in the other five applications – which did not concern investigative reportages, strictly speaking – that we needed to clarify the funding criteria. We have since done this, and we presently expect to receive more relevant proposals. In 2016, we launched ‘No News is Bad News’, our new Strategic Partnership with the Dutch Ministry of Foreign Affairs. Over the next five years, we will be working together with the European Journalism Centre (EJC) to implement this programme in 17 countries – from Bangladesh to Somalia. Our objective: to promote societies where independent media organisations and journalists form a diverse and professional information landscape and serve as drivers and catalysts for change. This objective explicitly goes beyond our mission to promote press freedom. We want to help media organisations and individual journalists to fulfil their vital role in society. The unbiased, reliable information they provide to the public is of crucial importance for citizens and civil society organisations who wish to influence the development of their communities (we refer you to our Theory of Change). For example, in 2016, we trained 16 Nepalese journalists in the basics of investigative journalism. Among other things, they learned how to produce well-researched stories about domestic violence and the trading of girls as ‘chattel’. We also worked together with existing and prospective partners on the organisation of so-called baseline workshops – in 13 of the 17 countries we are active in. In the case of the other four, this is the first time we will be working in these countries – meaning that we needed more time to prepare. We will be holding the baseline workshops for these countries in 2017. In these baseline workshops, we lay the groundwork for our long-term collaboration with these local partners. We analyse the country’s existing media environment, examine which support our partners require in the context of their influencing activities and determine whether their organisations are ready to set to work on the new programme (we also refer you to our Theory of Change). Free Press Unlimited will enter a new phase in 2016. The financial support from the Medefinancierings-stelsel (the MFS-II co-financing programme) will then be in place and we will start our Strategic Partnership with the Dutch Ministry of Foreign Affairs (2016-2020). We set up a number of new large-scale programmes in 2016. We also introduced a new organisational structure and new staffing, and started implementing our new strategy. In other words: in 2017, we will be able to go ‘full speed ahead’. At that point, we will have laid the groundwork for our programmes, our new teams will be more closely aligned and we can start booking results. And thanks to the input of our Knowledge & Quality team, we will be able to quantify these results more precisely than ever – and offer more insight into the true impact of our work via the stories of the people whom it is actually all about. We are confident that our new MEAL system will yield valuable new insights that we can share with our partners, colleagues and donors. Moreover, over the next few years, we intend to make far more use of the expertise of some of our highly-valued local partners. In 2016, for example, we asked one of our partners in Malaysia to think along about a problem that we had encountered in Zimbabwe. We will be making further work of this kinds of cross-pollinations in the coming period. In 2017, we will also continue to develop – and draw attention to – our long-term strategy for the post-2017 period. Of course, we have already been giving thought for some time now to our strategy for the period after 2020. That year will mark the end of both our Strategic Partnership and the Sida funding for our large-scale programme in Syria. Will our current partnership with the Dutch Ministry of Foreign Affairs be followed up? Will we retain Sida as a major donor? What will happen to the Russian-Language News Exchange? We will also need to answer other, less pragmatic questions. Free Press Unlimited would like to initiate fundamental research into the question that is at the forefront of public debate around the world: What is the impact of journalism? How does it contribute – and in which forms – to the democratic process and a more informed populace? This issue is something that we plan to shed light on in our future long-term strategy. Over the course of 2015, we already adjusted our strategy in relation to financing and fundraising. We have decided to execute fewer small-scale projects and increasingly focus on large-scale programmes – as well as seek the associated financing. In 2017, we will continue on this course. In addition, we intend to spread the risks of funding interruptions. In some cases, donors stop funding our projects in conflict areas fairly abruptly – in response to a sudden upsurge in fighting, for example. To prevent projects from immediately coming to a standstill – leaving the population without a reliable source of information – Free Press Unlimited will work to arrange the support of multiple donors. By now, Free Press Unlimited is broadly recognised as a source of expertise in the field of media and information. This has given us growing influence on the policies of government organisations and private institutions at the national and international levels. Over the next few years, we will make unrestrained use of this influencing capacity to promote the causes of press freedom, the protection of journalists and the further professionalisation of local media organisations. 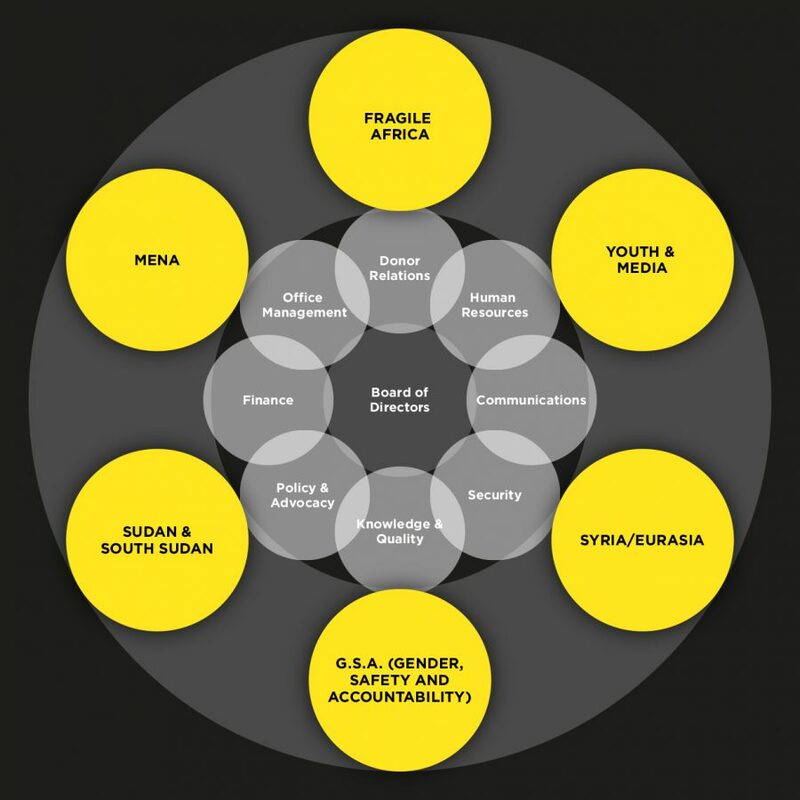 So that working together with their audiences, the media can become catalysts and drivers of change – particularly in areas suffering under government oppression or violent conflict.